First of all, when I say draw, I mean scribble. One does NOT need to be an artist or even talented at drawing to get an image down onto paper. No need for drawing paper or fancy art materials, only a pencil and a piece of paper. The drawing is for your eyes and no one else’s. So what does it matter that someone might not understand the picture or be able to discern the particular image you drew? What does it matter what it looks like? What matters is your experience in the drawing of it and the emotional results you get. Recently, my trauma as a survivor of infant surgery without anesthesia for pyloric stenosis at 26 days old was restimulated. Some of the symptoms of post-traumatic stress got fired up. I needed to do something to soothe myself. I remembered the narrative “Heal Your Infant Trauma” that Dr. Tinnin had written in his blog under the Comments dated May 20, 2013 (scroll down to date). One of the steps to take in healing from the trauma of infant surgery is to draw something that represents the trauma afterward, something to show that you survived it–a “self-repair” image. This is likely true not only for infant surgery but in healing many types of trauma. The first image is of me with stitches on the operating table, surgeon nearby. The second is me in the recovery room, receiving oxygen while my mother looks on from a window in the hallway. 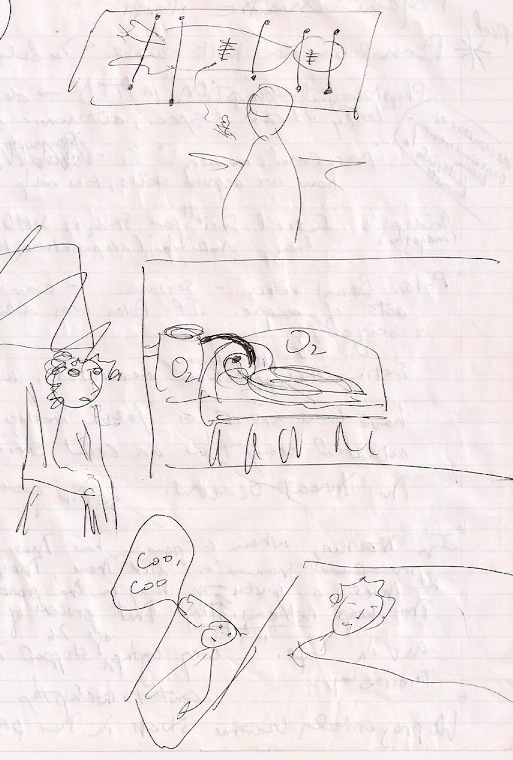 And third is me home lying in a crib “cooing” next to my mother as she sleeps in her bed. These pictures reinforced the fact that the trauma was over and that I’d survived. After drawing these images, I felt more calm and grounded. The surgery was put into perspective for the moment. The fear and the sensation of floating and helplessness I’d felt had been relieved. Drawing these images took no more than a few minutes. And the relief I felt was palpable–the reason for doing them in the first place. It’s not that post-traumatic stress symptoms won’t be triggered again. I was though empowered in the moment to take care of myself in a positive way. Try it!! Thank you for this post, Wendy! It is motivational. And I will soon – and let you and the readers of my blog know! Thanks for the encouragement and the gentle push.